Replicating the complicated muscle structure that allows fish to wiggle their bodies and dart through the water is no easy feat. But not every underwater creature moves that way. Cuttlefish instead use long fins that undulate in waves to propel themselves, which is an approach that robotics maker Festo found relatively easy to replicate. Festo's new BionicFinWave robot isn't the first underwater automaton that replicates the movements of creatures like cuttlefish or marine planarians. Robotics engineers have been working to replicate Mother Nature's designs for decades, and when it comes to swimming, the undulating fin approach is one of the easiest. So what makes Festo's creation stand out from its predecessors? By simplifying the design, using a pair of one-piece silicon fins powered by just two servo motors, the robot can move about underwater without any cords or tethers. 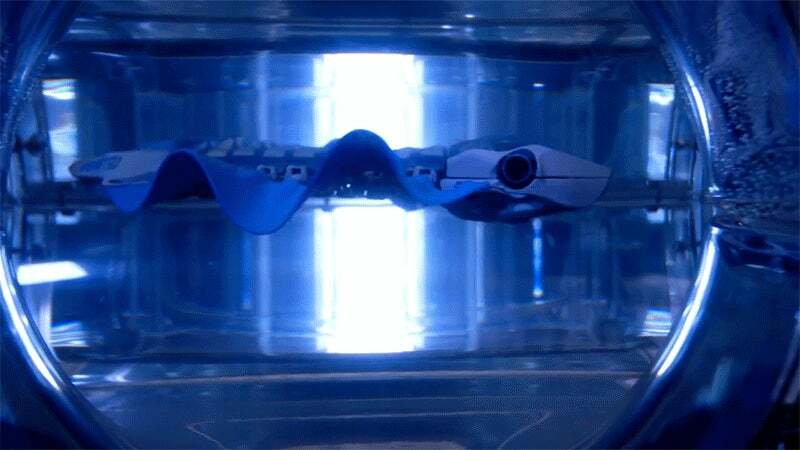 It's completely self-contained, including battery packs that not only power the fin motors and wireless communications, but a servo in the head that allows the BionicFinWave to flex its body so it can swim up or down. The BionicFinWave isn't just an exercise in copying Mother Nature. Robots like these can be used to autonomously monitor underwater conditions, as this one does with temperature and pressure sensors that wirelessly send data to a tablet outside its enclosed tank. There's even the potential to incorporate this unique propulsion system, which allows the robot to move in almost any direction in 3D space, into submarines and other marine vessels, making it even harder to hunt for Red October.